James N. Muir was born in Indianapolis, Indiana 1945. He attended the United States Military Academy at West Point for one and a half years and completed his B.S. Degree at Indiana University in 1970, while also having served six years in both the U.S. Army and Air Force. His professional art career as a sculptor began in Arizona in 1980, where he has continued to be a full-time professional artist for over three decades. He owned his own bronze casting foundry, Seraph M Fine Art Bronze, from 1982 to 1988. 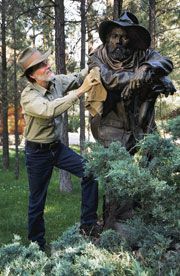 Muir has completed over 100 sculptures to date, with over 60 lifesize and monumental sculptures placed in public locations across the country and abroad. Muir's early interest in history and the military was reinforced by his experiences as a West Point cadet and to which he also attributes the cementing of his personal “Code of Honor.” Muir’s ever-deeper involvement with horses, and his continuing quest for spiritual Truth, led him to Arizona in 1979 for the freedom and inspiration of the great American West. He ultimately settled in Arizona and there embarked on a full-time career in sculpting, initially specializing in historical subjects. In 1990 he began to expand his work to include contemporary subjects and accepting commissions in lifesize and monumental. Recent commissions completed are the 33 foot monument (Christ/Crucifix) for The Chapel of The Holy Cross in Sedona, Arizona, and the 24 foot tall monument (The Last Horseman) for Martinsburg, West Virginia.. These followed the monument for Texas A&M University which symbolizing their 6 Core Values. the spirit of the human journey. The book was recognized as its own work of art: Muir received the “2004 Pinnacle Book Achievement Award” in the Inspirational Category.